Alexander McQueen nearly two weeks after his death. The intimate service was held for family and intimate friends only, in attendance were his friends Naomi Campbell, Kate Moss and Stella McCartney. 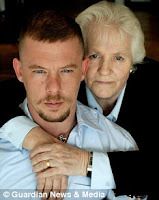 McQueen is pictured on the left with his mother Joyce, the designer committed suicide in his London apartment on the eve of his mother's funeral. May his family and friends find comfort in his memories, RIP Alexander McQueen.